The meeting room is intended to further the library’s mission of facilitating the free exchange of diverse ideas and information. The room, therefore, is generally reserved for library activities, including programs presented by library staff, by the Friends of Rogers Free Library, and/or other groups affiliated with the library. Whenever the meeting room is not being used for a library activity, however, it may be available to the public for educational, cultural, non-profit, civic, or governmental programs or meetings. Please leave the room the way you found it; pick up trash, shut off coffee pots, etc. Please use the Thames St. door to exit the building after your meeting; the rest of the library is locked after 8:00 p.m.
All meetings must be open to the public, at no charge to the attendees during regular operating hours. Meetings will be posted on our meeting room calendar on our web site. All meetings must be concluded by 8:30 p.m. Meetings may not be scheduled more than 60 days in advance. Persons or groups must submit a completed Reservation Request Form to the library’s administrative staff. The reservation shall not be considered complete until it has been approved by the appropriate library staff. The meeting room is intended for specific events or programs rather than for regularly scheduled, on-going meetings. Nothing may be mounted or affixed in any way to the walls of the meeting room. Groups or individuals using the meeting room are responsible for the set up/take down of all tables and chairs used and for leaving the space in the same condition in which it was found. THE LIBRARY DOES NOT PROVIDE TECH HELP FOR PROGRAM PRESENTERS. You may come in prior to the meeting to familiarize yourself with the equipment. Groups or individuals reserving the meeting room shall be responsible for any damage to or loss of library property. The kitchenette in the meeting room may be used for the preparation of light refreshments, but no meals per se may be prepared and served. Clean-up is the responsibility of the users of the room. The kitchenette does have coffee pots and carafes available. Absolutely NO smoking or alcoholic beverages are allowed in the library, including its meeting room. If a group or individual cancels a scheduled meeting, the applicant must inform the library administrative staff as quickly as possible, as others may be able to use that time-slot. The library assumes no liability for theft or damage to property brought into the library or its meeting room, or for injuries which occur therein. The Director of the library is responsible for the administration of this policy and, with the Board of Trustees, for establishing administrative procedures to implement it. Failure to comply with these meeting room policies/rules may result in the loss of meeting room privileges – immediately and/or in the future. Policies and/or rules governing the use of the Herreshoff Community Meeting Room may be amended at any time by the Board of Trustees of the library. The Board reserves the right to do so accordingly. Please announce before meetings that the room has two emergency exits. 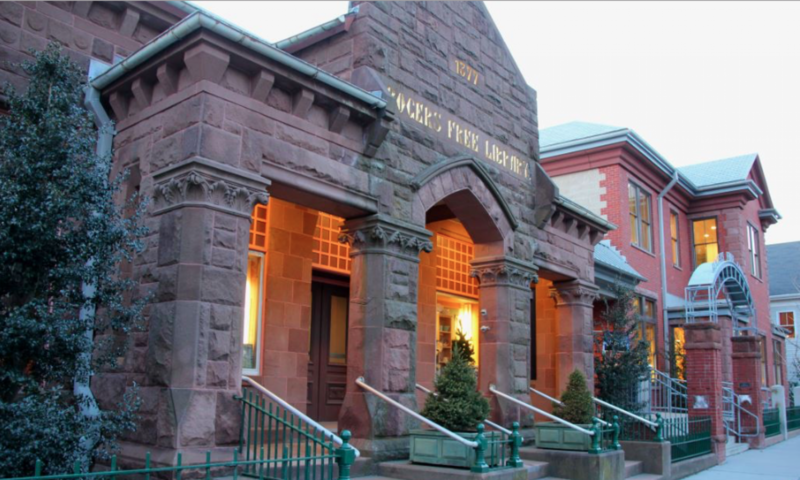 DISCLAIMER: Rogers Free Library does not endorse the philosophy, opinion, or points of view expressed by any/all of the diverse groups, clubs, civic/educational/cultural associations that reserve and meet in the Herreshoff Community Meeting Room.